The content marketing department at Surround Digital Advertising Agency really shined in June 2015 telling very sticky stories on behalf of Basic Funerals cremation services. It all started when the website administrators at the Mississauga based death services firm asked Dave Conlon, their account manager at Surround, for SEO help with an eye on ranking higher on Google.ca for the popular search term ‘cremation services’. Dave brought the assignment to the content marketing team here, because at Surround we tackle SEO primarily through strategic storytelling alongside necessary ‘on-page’ tweaks. The mission, as interpreted by myself and other members of our group, was to make the website’s cremation services destination page more important on the web by increasing its authority by building more incoming links in content made popular through social sharing. But just what intelligent and compelling stories do you think a digital advertising agency could tell Canadians about Basic Funerals ca affordable cremation services? Perhaps we could detail the company history as we profile the CEO of this rapidly expanding five year old company? Or maybe we could describe their innovative approach to Death Services in Canada? And of course we could always write about the science of cremating human bodies, and perhaps even do a video..? But really, when you think it through… to make interesting content in that vein, we’d be risking their brand. What I mean is, by writing those types of stories we’d be tempted to stress grotesque elements, and find and explore controversies that hint at morbid details… It’s not a good brand story, and at Surround we only tell great stories. After visiting the BasicFunerals.ca headquarters and meeting COO Dave Laemers, and CEO Eric Vandermeersch, I decided not to write about the company itself, but rather to seek curious facts on the periphery of their niche, and source story nuggets more worthy of our packaging. Right after their personal tour, I considered profiling a 21st century funeral director who uses Facebook and Twitter pics in eulogies, but soon discovered that every funeral director does that these days, and companies offering that service directly compete with BasicFunerals.ca. So my mind’s eye turned to rent-by-the-hour funeral chapels, exotic floral arrangements, best funerary themed confectioneries… unusual caskets, high tech coffins and then it hit me… Art glass funeral urns! Glassblowers are cool, and its a fact they are much busier these days making funeral urns and sculptures for cremation services than ever before. In the nineteen sixties less than five percent of Canadian families chose cremation, but today that number is over sixty percent. And YES there is a connection between the increase in production of glass funerary art, and the steadily decreasing cost of cremations brought about by Basic Funerals. With that realization, the idea for an interesting news story was born: Cheaper Cremations Increase Funerary Glass Production was published on Digital Journal on June 30th, and an effective SEO driven content marketing campaign followed in the first week of July. How Exactly Does Surround Do Content Marketing for SEO? 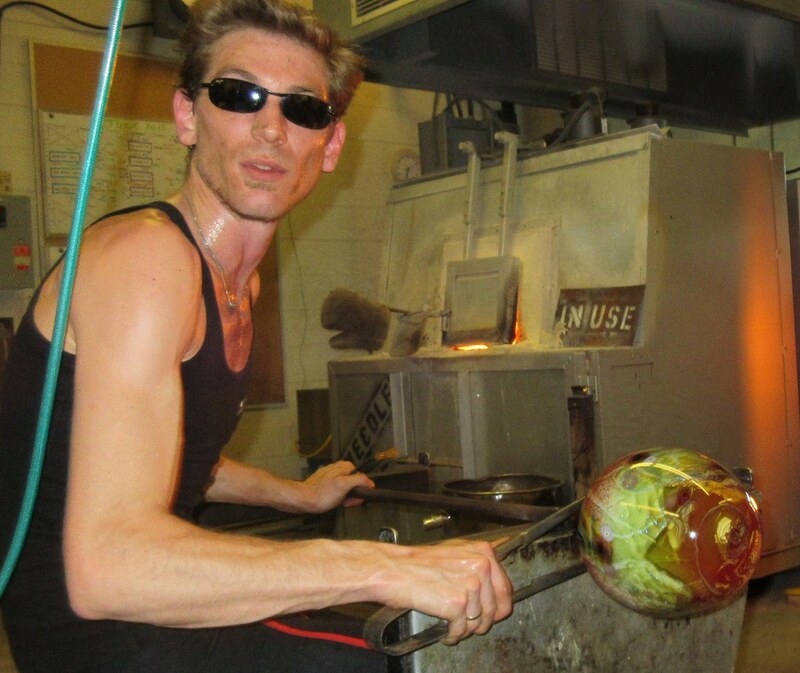 To get started, I tracked down Albert Engerer of Giesterblitz who put me in touch with Eric Davy a funerary glassblower who specializes in making art glass funeral urns and memory glass paperweights in Toronto. As luck would have it, Eric had just sublet the glassblowing studio on the ground floor of the Living Arts Center in Mississauga to work on a custom ‘red bottom and blue top’ glass funeral urn. The basic red and blue colour scheme would be amplified by the addition of gold foil and the resulting random pattern is Eric’s signature style. It has become most his most popular colour theme request from funeral directors who have seen its grace and beauty. So of course I begged to be allowed to watch the process, and in turn invited Darian Schouten who brought a fancy camera that did a much better job than my own camera capturing crisp details in the low light conditions of the glassblowing studio. I put our best pictures on my own Flickr gallery titled Funerary Glass. Upon learning the direction I was taking, Geoff Whitlock the President of Surround pinged me and asked me to reach out to Angelo Rossi the master glassblower and principle attraction in the tourist activity center at Skylon Tower in Niagara Falls. Mestro Angelo Rossi is Canada’s foremost ‘hot glass artist’ and cranberry glassblower with a legacy made in the 1970s and 1980s Canadian art glass market. He was born and raised until the age of ten on the Island of Murano in Venice Italy. So for him to perform for me now, to show me how he makes his Memory Glass, and then to make The Angel with real cremated human remains right in front of my eyes, was nothing short of a spiritual experience. Hot glass being rolled about in cremated human remains to make Memory Glass. Memory glass is a little different than normal coloured glass; the substance contains one very special ingredient, cremated human remains. In these unique art pieces, bone ash is incorporated right into the mix and appears as puffy white clouds inside the transparent glass object. This art form is as old as the Greeks and was popular in Roman times, and has since come in and out of style for two millennium. Below you can see how the hot bud, a thumb-sized dollop of molten glass is coated in ash before ‘the gather’ where more glass is added; this ensures that the ash will be contained and visible in the core of the piece. You can just see the ashes in the body of The Angel. Fuel Ghoul blog describes the technical difficulties of making memory glass due to the different rates of thermal expansion inside glass, and how foreign bodies in the composition of glass vessels can make the pieces weaker and more prone to cracking as they cool. Memory glass artists must strike the perfect balance between art glass and the aggregate cremated material which does NOT bond with the glass itself, but expands in the heat to make creamy white bubbles inside the piece. The story of Angelo Rossi and Eric Davy making increasing amount of funerary glass, and the details of their work, provide a fertile construct where a link to Basic Funerals ca can appear as an information resource on the cost of cremation services. Publishing and promoting such narratives have indeed made BasicFunerals.ca more important on the web, with more perceived authority on the subject of cremations, and this has had the desired effect of pushing the company website’s page URL to the top of the index for all search queries related to ‘cremation services’ in Ontario.